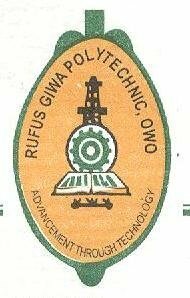 Rufus Giwa Polytechnic, Owo (RUGIPO) Coaching Class, Foundation Programme (Pre-ND), National Diploma (Part-Time), Higher National Diploma (Full-Time and Part-Time Basis), Diploma And Certificate Courses Admission Form 2018/2019 Academic Session. Applications are hereby invited from suitably qualified candidates for admission into the Rufus Giwa Polytechnic, Owo (RUGIPO) Coaching Class, Foundation Programme (Pre-ND), National Diploma (Part-Time basis), Higher National Diploma (Full-Time and Part-Time Basis), Post-Graduate Diploma, Professional Diploma And Certificate Courses for the 2018/2019 academic session. Registration for HND Full Time, HND Part Time ND Part Time Pre-Degree and other programs on the RUGIPO Portal has been opened . Latest Update: Sale of application forms for National Diploma Part-time and Higher National Diploma (fulltime and part-time) programmes has been extended till Friday, 8th February, 2019. Also Read: RUGIPO Post-UTME Admission Form 2018/2019 | Supplementary. Click HERE to download the list of courses available and the requirements for each programme in PDF. Post-Offices in Ondo, EKiti, Lagos, Osun, Edo, Oyo States, Abuja, Port-Harcourt and Higher Institution Consultancy Centre (HICC) office behind the Directorate of Academic Affairs of Rufus Giwa Polytechnic, Owo. The candidates that apply for HND Programme in the Departments of Computer Science, Computer Engineering, Office Technology and Management and Electrical Engineering will write the Computer Based Test. Candidates can now correct any error made on their profile by paying certain amount of money through the Etranzat Invoice Generated. Candidates are advised to input correct result and correct profile while filling the form. Candidate for HND Programs should carefully select ND School to avoid disqualification. If your ND school is not listed among the Schools kindly make a call before filling the form. Any candidate who submit wrong data will be disqualified. Read Also: RUGIPO HND & ND (Part Time) Entrance Examination Schedule 2018/2019. Online Sales of application forms for National Diploma part-time and Higher National Diploma (fulltime and part-time) programmes has been extended till Friday, 8th February, 2019.